My updated Twitter feed, 2.0! Though I've had a Twitter account for awhile, it's one of those things that takes a while before you figure out what you can do with it, without wasting numerous hours daily. But I think I finally have it set up with some cool stuff you might fine interesting. At least I hope so! There's new links daily to articles about photography, technology, and travel too. Not your five star resorts, though. The travel links are more of the "Roads Less Traveled" destinations. Although it's certain possible in many cases to spend your evenings at a nice resort and take day trips on "Roads Less Traveled." And you don't need to have a Twitter account to read it either. Just click on the Twitter link on the right of the page, and it will bring you to my new Twitter 2.0. There you'll find a short description of the article, and a link to click. Hope you find something interesting! This was spotted in the vicinity of the subjects of the last two Whimsical Wednesday photos. 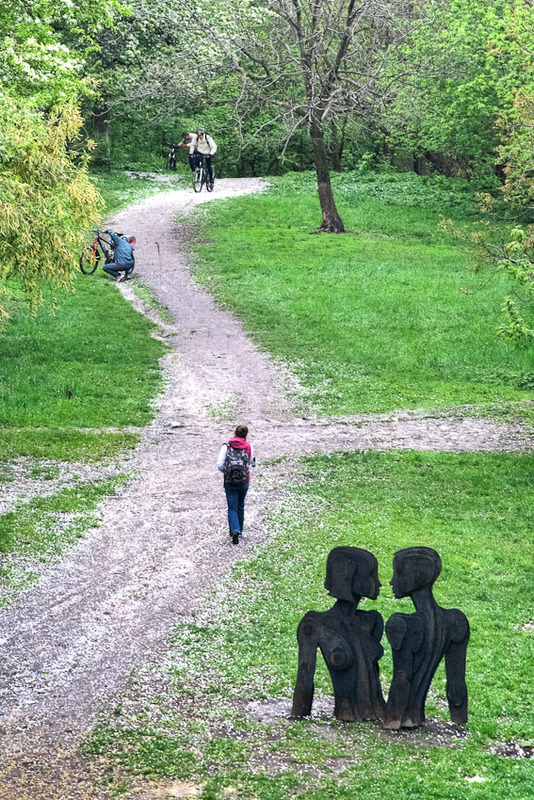 I was way up on a hill, and this sculpture was down below, but looking at the photo close up, it appears that our young lovers are made of car parts!